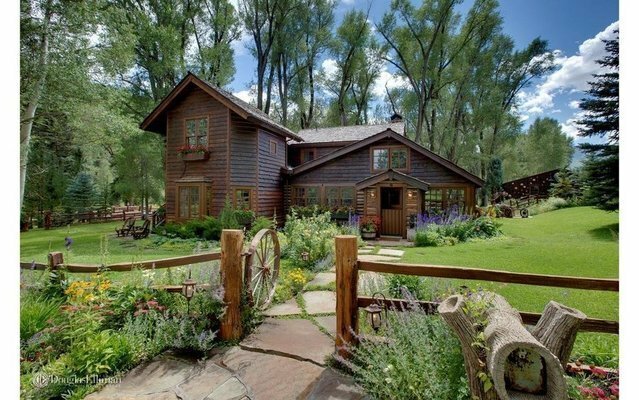 The Rockin' M Ranch is abeautiful, quiet and serene 33+ acre property located on the banks of Snowmass Creek. The nearly 100 years of history is well preserved in the elegant 4 bedroom, 4 bath log home which is remodeled to perfection! It is lavishly furnished and ready to move in and enjoy! The sights and sounds of the rushing Snowmass Creek which meanders throughout the property can be enjoyed from every room in the house. Flower gardens and terraces surround the house!The Rockin' M Ranch showcases mother nature at its finest with grand views, abundant sunshine, lush rolling lawns, a picnic park on the creek, two ponds ready for canoes, trails though the forest, a playground park across the private bridge over the creek. and fly fishing on both sides of the creek!